Act 3 of the setlist completely ruined by the last featured track. i'd have called it Warriors Hand of Rock Evolved..... gotta have evolved in the title it makes it sounds NEXT GEN! The figures, which were obtained by CVG from analyst Cowen & Company, represent a serious decline for the series. Guitar Hero 5 managed 499,000 sales in its first month in 2009, Guitar Hero: World Tour topped 500,000 in its first week in 2008 and Guitar Hero III managed 1.4 million units in five days the year before. 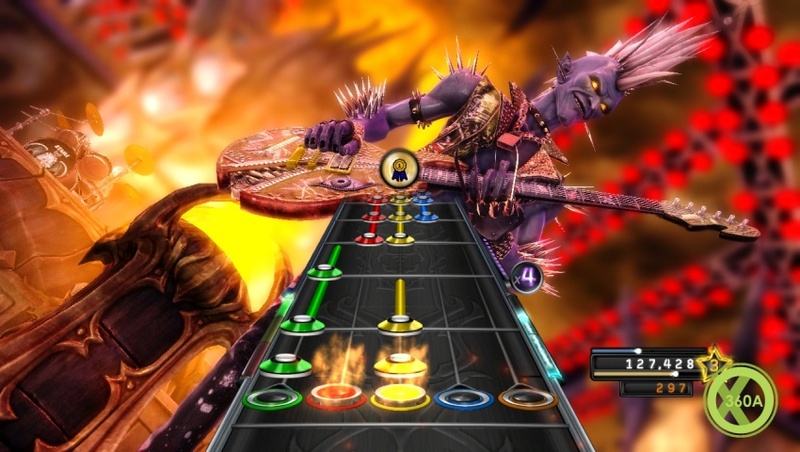 Guitar Hero: Warriors of Rock entered the UK all-formats chart at six when it launched last month. Eurogamer's Johnny Minkley awarded the game a solid 7/10. Earlier this year, Rock Band developer Harmonix talked down fears that the music genre was in terminal decline. CEO Alex Rigopulos claimed, "I absolutely do not believe that rhythm-action gaming has reached its peak." Let's see if Rock Band 3 fares any better when it launches for DS, PlayStation 3, Wii and Xbox 360 on 29th October. i had someone sell me this today, he's only had it a week, said it was just 'more of the same'. Sounds about right, i'll rent it and say the same once i'm done with it. When it comes to 'rhythm' games, I'm a total casual gamer. Guitar Hero is just too competitive/challenging for my taste. I want to get drunk and have fun. Rock Band all the way for me. I've had a go of GH: Warriors of Rock and tbh the tracks on it are really good, i had a great time playing. Activision has declared that it'll be pulling all DLC for Guitar Hero, DJ Hero and Band Hero at the end of this month, putting an end to the content's availablilty. This also includes Guitar Hero mobile games as well as console releases. "We want to thank all of you for supporting Guitar Hero over the last nine years," Activision stated on its Guitar Hero Facebook page. Before the content is pulled, fans will be able to purchase selected tracks at a 50% discount, as a "thank-you". Guitar Hero servers will remain online, however, and all songs already purchased will still be playable. Activision is hopeful that Guitar Hero will return one day in a "reinvented" guise, while Rock Band will apparently return "at the right point in time." The DLC for the latter game remains available. Get your Guitar Hero songs in while you still can then. The content will be pulled on March 31st.